Report filters allow you to look at a sub-set of your data within your summary charts. They can be based on answers to survey questions, user profile properties, hidden items, and date ranges. For example, let’s say your survey includes a question asking each respondent’s age. When you create a summary report for your survey, data from all your respondents will be displayed by default. However, if you only wanted to see the results for those respondents who were ages 18-24, you could add a filter to your report or chart to do this. This guide will walk you through creating and applying filters to your report. Create a summary report using the Quick Report or Custom Report tool. The report below is an unfiltered report for a survey called “Customer Feedback Survey.” This survey has 2,557 total responses. 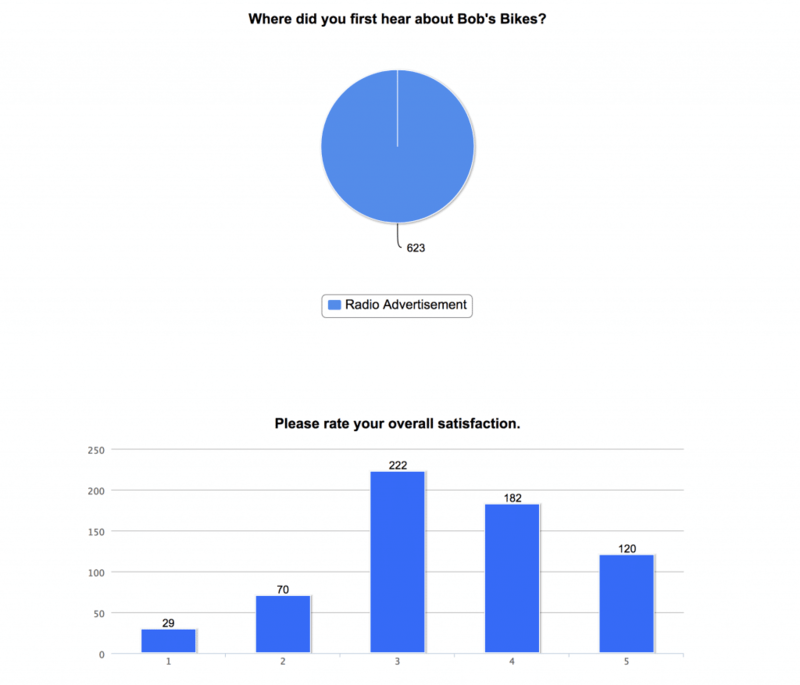 In this guide, we will apply a filter to this report so that only respondents that said they heard about Bob’s Bikes from a Radio Advertisement will be included in the results. Filters are created in the report editor but, once created, can be applied to any report or chart for that survey. To create a filter, click the Filters button in the report editor to bring up your filter options. Then click the +Filters button. Then choose the Question, Response Property, or User Attribute you would like to use in your filter and click save. Creating your filter will automatically add it to the Applied Filters list, shown in the dialog below. You can choose to remove it, apply another filter, or just click Save to apply your new filter. Refresh your report window or click Report Actions -> Run to re-run your newly filtered report. 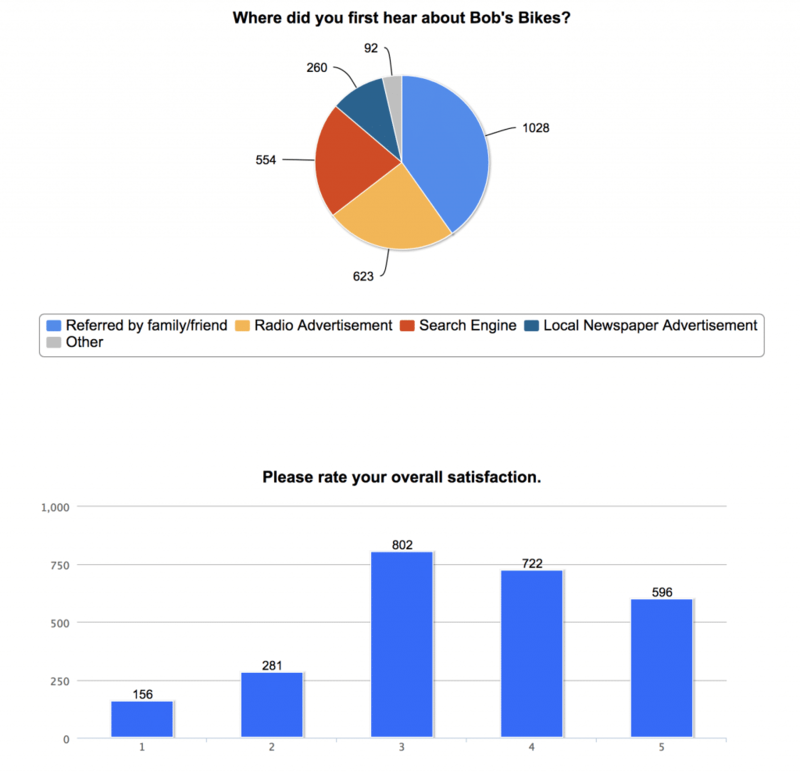 You can see that our report below now only includes 623 responses, corresponding to the number of people who answered “Radio Advertisement” to question 1. In the steps above, we applied a filter to an entire report, so that all charts were filtered by the criteria “Radio Advertisement”. However, you can also apply a filter to individual charts in your report. This method is often used to compare filtered results of a single question side by side, since you can copy a chart in your report and apply different filters to each chart. To apply filters to a single chart, follow step 1 above to create an unfiltered report. Then select the chart you want to apply the filter to. Click the Filters tab for that chart. 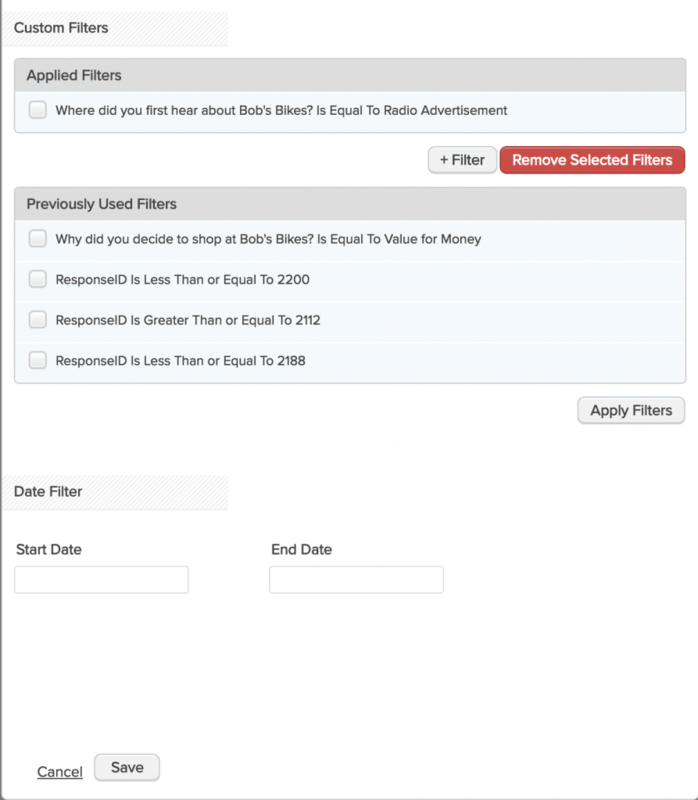 Either click +Filter to create a new filter, or choose the existing filter you want to apply and click Apply Filters. Run your report and ONLY the chart you edited will be filtered. All other charts will be based on the full data set.